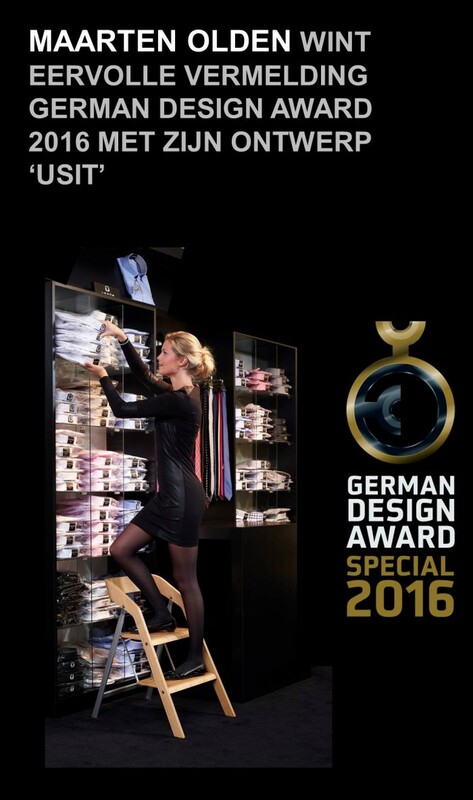 Maarten Olden wins special mention German Design Award 2016 for his design ‘USIT’. By the German Design Council Dutch designer Maarten Olden is awarded with a special mention for his innovative furniture design “Usit”. 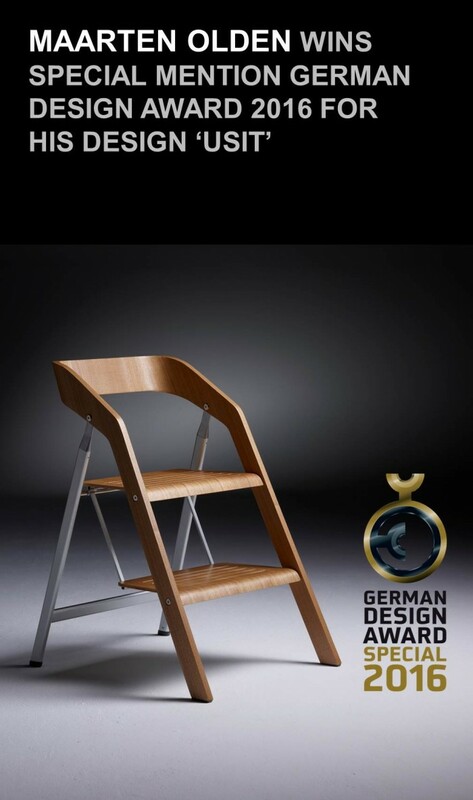 The prestigious German Design Award is awarded each year for outstanding solutions in design. “Usit”, a design that is both a chair as a stepladder within itself, was awarded this honourable mention for “Excellent Product Design” in the Household category. This award is presented annually to works that are distinguished by exceptional design solutions in inventiveness, form, function and technology. “Usit” arose from the need to develop without an overly technical appearance that belongs in contemporary interiors and can be left in the living room after use. Maarten Olden designed a perfect combination of furniture and industrial design, in which he combined his knowledge of and passion for interior and industrial design. The “Usit” is an extremely comfortable chair, and a very safe stepladder – a chair-stair. The two-step version can be used as a chair; the three-step version as a tall stool. This stylish blend of wood and aluminium with innovative details, is available in two versions and three colour combinations. A sophisticated combination of nostalgia and innovation in robust industrial design, suitable for people with limited space is limited, and anyway design lovers in general. Smart, simple, stylish and solid. Each year, the German Design Council, the leading brand and design authority in Germany, gives awards to national and international products at Excellent Product Design and Communication Design. 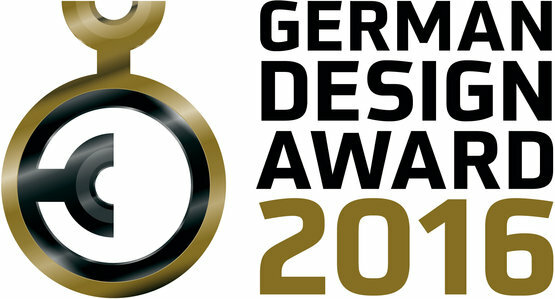 The German Design Award is the highest international award in Germany. This year there were 3,400 entries. The jury of the German Design Award 2016 consists of a large number of eminent design experts from different disciplines and various countries in the world. On February 12, 2016 the German Design Awards will be presented at the international trade fair Ambiente in Frankfurt am Main.